A North Carolina grandmother is "horrified" at the condition of her 4 year old grandson Malakai. The deterioration in his health reportedly happened AFTER Child Protective Services removed him from his family and placed him in foster care. She reports that he had previously been very healthy, with no medical problems. Now, the foster parents are collecting disability payments for him and he looks like he is starving. Kimberly Deese is fearful for her grandson's life. 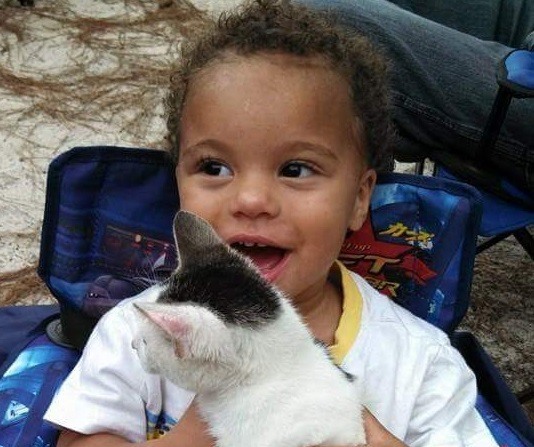 The family claims that no matter what hoops they jump through or what evidence they provide, Wake County CPS seems determined to sever all family connection to Malakai Deese and adopt him out. Heather's parental rights have just been terminated, and CPS has made it clear that they refuse to consider placement of Malakai with his maternal grandmother, without basis, and in violation of both state and federal law. The family hopes to appeal, but they have only until December 4 to do so. Ironically, grandmother Kimberly had just finalized her adoption of another grandchild only a month before Malakai was seized by CPS - in the same county. Yet, when it came to Malakai, the social worker refused to do a home study or consider placing the toddler with his grandmother. Are you already a member of the KY group? It is the only active group right now trying to tear this institution down. Even if you are not in KY, please join the group and help us FIGHT. Hope to see you there! BEWARE: THE STATE OF MICHIGAN, TOGETHER WITH ONE OF THEIR SPONSORED ADOPTIVE AGENCIES/GROUP HOMES #DID# TERRORISTICALLY STARVE A HANDICAPPED (and medically-kidnapped) BOY TO DEATH (in recent years) - all while his pleading mother was forced, by terroristic and corrupt [falsely named] child protective service agents (and their co-conspirators), to merely be able to helplessly look on; as corrupt, evil, willfully ignorant, greedy, and NEGLIGENT persons slowly STARVED and NEGLECTED her boy to DEATH. It is becoming obvious to the world that many of these conspiring kidnappers/terrorists of various states are quite dangerously demented and conscienceless, with the grotesque injustices and outrageous human rights violations they are willing to perform, for $. If there is to be a "war on terror", it would be efficient and productive to start right on the "homeland" turf: There are many life-destructive, conscienceless, corrupt and dangerous persons harming and threatening others across this land - the corrupt ones falsely bear the titles of "child protective service" (or similar-title) agencies and workers. They have co-conspiring corrupt judges, corrupt law enforcement, corrupt "medical" "doctors" and hospital personnel (even at church hospitals), human traficking adoption agencies, corrupted group homes looking for profit (at any cost to human lives), corrupt persons of pharmaceutical companies in want of human guinea pigs, etc. working their terrorism along with them. Please hone in on THOSE terrorists, as they are a danger to the public; are destroying the general security of the public - they are greatly disturbing many persons; and they are destroying innocent children and their innocent families. They are terrorists at large, performing crimes and harm against the public. It should be easy enough to locate and dismantle the "cells" of these corrupt and destructive persons, as the internet is getting full of accounts of their human rights atrocities, family-i-cide, child kidnapping, terrorism against innocent parents, and harm and death to children that the state agents and their co-conspirators have been working - WITH GROTESQUELY WRONGFUL IMPUNITY. Again, THEY BELONG IN PRISON. I posted this to Pat McCroy's Facebook page ad asked why he has not helped you. I will tell you from personal experience the governor's are not going to do ANYTHING until public pressure is put on them. The state my case is in probably has one of the most conservative governors in the country. I thought they would help us. No, they just give everyone the same 'ol line: "It's in the courts, there is nothing we can do about it" and "the governor can't get involved in legal issues". Yes, I did point out to them that the governor is the head of the agency and, therefore, he has control over them. Nope, doesn't work. It's in the courts. So where does that leave violated parents? At the hands of a corrupt judicial system that has total immunity to do as they please? Forget our constitutional right to a trial by jury. Nope, can't have that in Family Court. Parents at the hands of court appointed attorneys who are being paid by the very entity that stole their children from them in the first place. Or, paying thousands of dollars to attorneys who are part of the whole scam of the BAR association and are not going to rock the boat, because it is their bread and butter. So where does that leave us as parents? It only leaves us one recourse, destroy the system as it is and rebuild it as our founding fathers intended it to be, via the constitution of our country. What other option do we have? To continue to let them steal our children from us? To hold them hostages until we COOPERATE with them? And, then, still possibly losing them anyway, or at least living under the fear and dictatorship of this agency, not only for the rest of our offspring's childhood, but on into the lives of our grandchildren, as we've seen on MK with such stories as the Prince family in Alabama and Amanda's story in KY. We have to fight back and we have to fight back NOW. What other option is there? None, in the land of the FREE. nationallibertyalliance.com is trying to rectify the illegal judicial system that is in place in our country. I have been following your comments on the Alabama story and I just saw the story of your grandchildren. I want you to know that I am with you and we are fighting CPS. We are probably going to go public with our story soon. This monster needs to be brought down. It is just horrible to see the pictures of your grandson with his bones poking out while in the care of CPS. We must unite as Americans and demand that this agency be held accountable for their violation of our constitutional rights. If you are not already familiar with them, nationallibertyalliance.com, is trying to restore our judicial system to the way it was intended by the founding fathers. I'm the grandmother of Malakai Deese, I'm praying that the INVESTIGATION in Johnston county will find that my grandson has been abused and that I pray he will be able to come home to to his siblings and I where he will be loved and cared for and most of all safe.. I have been so worried about Malakai. I need every one to please share this story and send prayers and that the Lord will touch the hearts of the social workers to please help save Malakai, and to bring him home. I can be reached at dreamingeyes49@aol.com for commits. Please share this story as s are facing nightmares such as ours. Blessings all.PS please call the Governor and tell him about this story that is out.